Whisky-Online Auctions (W-OA) have positioned themselves as market leaders in unearthing exceptional rarities as well as providing every-day drinkers. That’s not to say other auction-houses don’t see uber-rarities, they do, however W-OA seem very good at digging up exciting old relics. Their recent auction was no different. We’ve already covered the new world record for the most expensive bottle ever sold via an online-only auctioneer. I’m not going to dwell on the 1919 Springbank which sold for £27,200 but suffice to say it will take some beating (a Macallan 1926 Fine and Rare perhaps?). Less than a week after setting a massive new £2,900 record, another bottle of Macallan ‘blue label’ 30 year old sold for £3,000 edging past its previous all-time high. Another high end bottle to squeeze in a new record was the Bowmore 1964 Fino which sold for £4,500. Its previous high price was £4,400 and with a record low of £1,300 in 2009 significant gains are being crystallised. 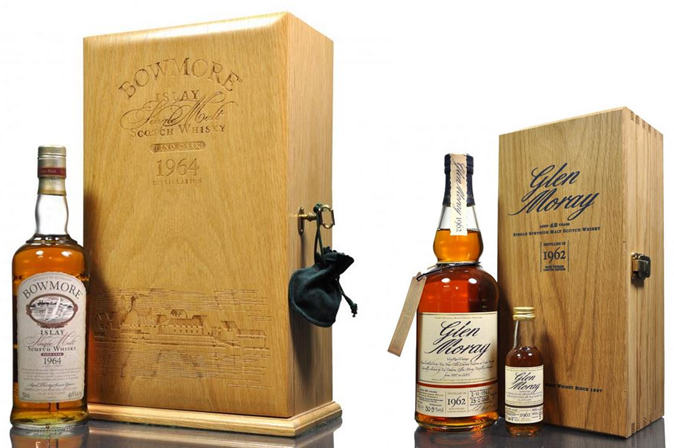 Staying in the 1960’s, a bottle of Glen Moray 1962 with accompanying miniature fetched £900. Not quite on par with the Bowmore, but with a previous record of £620 in 2014, and its lowest price of £220 in 2009 this old-timer’s performing well. The oddity of the auction was a huge peak for the Glengoyne 2000AD Millennium edition with miniature grandfather clock. These have been relatively consistently selling for around the £400 mark with a previous record of £715 and an all-time low of just £190 in 2011. Expect to see a significant pull-back; however, the new record set for this bottle/clock combo was £1,150. 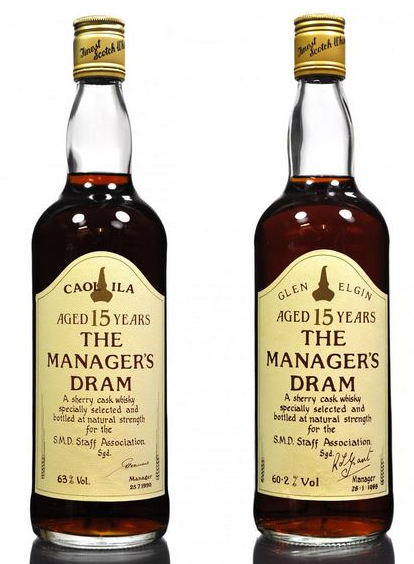 The Managers Drams have been mentioned before in that they look like they might be ready to take a more sustained rise, certainly for the older bottles. Two iconic releases from this series sold for good prices. The simply stunning Caol Ila equalled its previous best of £1,600 and the very first Managers Dram ever released, the Glen Elgin 15 year old, achieved a record £480; way past its 2013 low of £190. Are Managers Drams set to see more sustained increases? Apart from some of the truly high end bottles, the highlight of the auction from my perspective was yet another amazing selection of the old Cadenheads dumpy bottles. Both green and brown glass variants were seen with some impressive prices to match the impressive liquid within. From a ‘best performance’ perspective, a bottle of Ardmore 1964 18 year old sold for £625, vastly outstripping its mere £170 in 2009. Other records were set by the 1964 17 year old North Port (Brechin) which surpassed its previous best of £300 as the hammer fell on £460. £460 also took the 1965 19 year old Ben Nevis sailing past its previous best. Two of these Cadenheads bottles had their first outing at auction in the UK. A 1965 20 year old Clynelish (old Clynelish, now Brora) achieved a healthy £1,350 and a 1972 18 year old Laphroaig settled for £1,300. 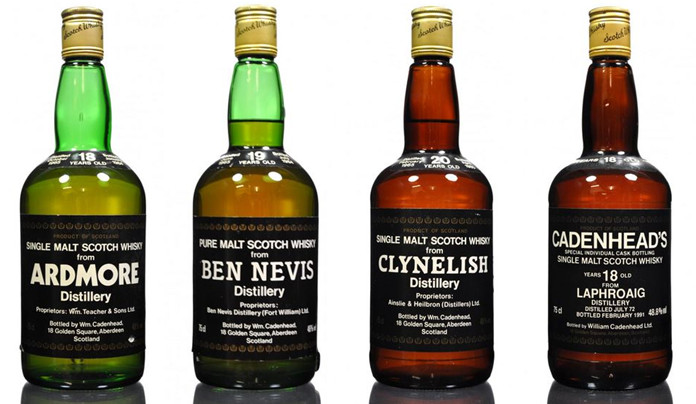 I did think the Clynelish/Brora would have gone for a touch more… maybe if it were labelled Brora it might have? As is usual, bottles from silent stills sold towards the upper end of the market. Special mention to Banff as a 1966 36 year old by Douglas Laing sold for £300 (previous best £170 in 2012) and a Connoisseurs Choice 1976/2002 hit £185 (having had a low of just £60 in 2012)…. Maybe 2012 was a bad year for Banff!? At the other end of the scale, Laphroaig’s Cairdeas bottles were off the pace, a bottle of Hazelwood 110 (the staff only William Grants release) sold for £205, (£15 above its lowest recorded sale but well down on recent prices) and Bruichladdich values were still in the doldrums. 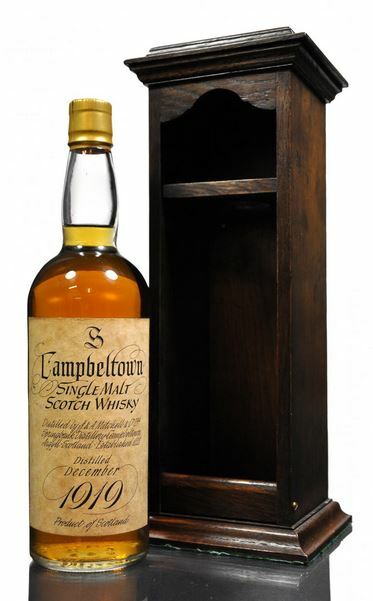 It has to be said that this was another top drawer sale from Whisky-Online Auctions. I still find it exciting when some of these amazing rare bottles appear on the market… more please!